Some indexes better then others but NQ is the best textbook TTT example. We reach the average 3 day rally which was at same level as yesterday's high and failed to go higher. Market reversed and reached the projected lows that offered some support and a bounce just to go lower found some support at the Buy day low and that finally gave through. I don't trade FX very often but this was to good to pass last night, as it is a good example of the type of trade that I often talk about in the conference calls. As I was doing the FX report I saw that USDCAD was around the 1.21xx level and I know that the 1.21 area usualy offers good support. I also knew that USDCAD today was on a SS day and had closed last night under the low of the Buy day low. I took a long at 1.2159 with a stop just under the lows of the day at 1.2120 and a target of 1.2364. The goal was based on the average 3 day rally target. 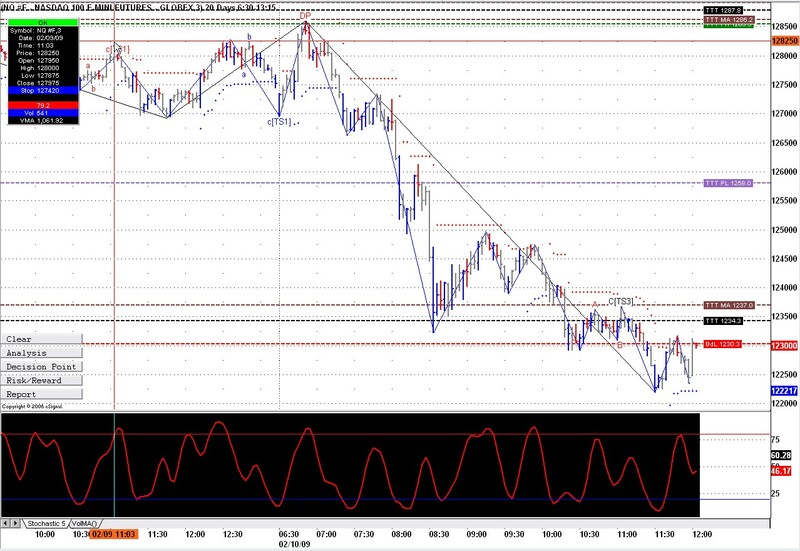 This is the kind of trade I look for since I don't trade FX on a full time basis. Today is a Sell Day. 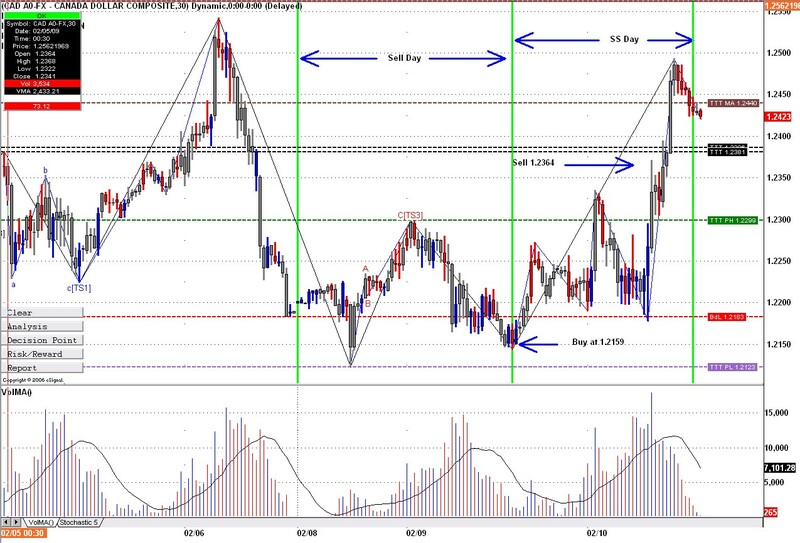 Based on Talor, there was a Buy Day Low Violation, hence a long was in order with the Buy Low as the target. At the moment it is struggling below 819. As the ESmini opened down with a gap, and 60min have elapsed, guess TVGR would be in effect and the market could likely go down from here. Having gapped below the Buy day low we have a 95% chance of getting back above that low at some point today. So far we only came close. Tape reading suggested a peak, with the 2 day positive rally completed, that would be an ideal short, is that correct? ES went a bit higher as it waited for YM to get above the Buy day low, as soon as it did we ended up with a nice ABC on ES and good divergence on the stochastic making it a nice short. Dont forget we still need a positive 3 day rally tomorrow. Today was a Sell Day. Was it confusing enough. We gapped down at the open below the Buy day low. Markets reversed and got back above these lows. When YM finally got above the Buy day low all markets reversed down. Coincidently when ES reached a new DP low, News came out and markets rallied like there was no tomorrow. This had to happen today or tomorrow as we needed to get back above the Buy day low on SS day to give us a Positive 3 Day Rally. Too bad I wasn't watching YM as that rally started right in the middle of the DP zone and right at TTT numbers. The Buy Day low was 819.50 and yesterday the market rose to 825 at 12.30EST, is that not a positive rally albeit a 2day one. does not the ES provide evidence of reversal? Today prices have risen to nearly 838 so guess the 3day rally rule is in place to short if the market dictates. Yes the Buy day low is 819.50 and when the markets rose to 825 yesterday I satisfied the Sell day conditions that we need a rally on a Sell day. However when it went back below 819.50, a new condition needed to get filled, and that is the Positive 3 day rally condition. The positive 3 day rally is calculated from the Buy day low to the SS day high. So we knew that at one point before the close today we would need to get above 819.50. The long on YM was easier to spot than ES as it reached the middle of the DP box which was also at TTT levels. Yes today is a SS day and when ES failed to take out the overnight high and barely got above yesterday's high it was a nice setup for a short. Rich, what happens to the 3-day cycle since Monday the market is closed? Does it skip Monday and continue on, or would Buy day still be on Monday and Tuesday at the open the market is on Sell day? Thanks.